The CHESS project was launched in 2017 as part of the P-7 Equal Opportunities and Higher Education Development programme. Universities are currently facing major challenges regarding the situation of their academic and administrative leaders. These include demographic developments with a resulting shortage of skilled workers, the blurring of boundaries between work and career especially in science, and the increasing complexity of management and leadership tasks at universities. These changing needs are accompanied by a shift in values, which have significant impact on the university leadership. In this regard, the creation of flexible working models can make a significant contribution to promoting work life balance and increasing the equality of women and men in management positions. 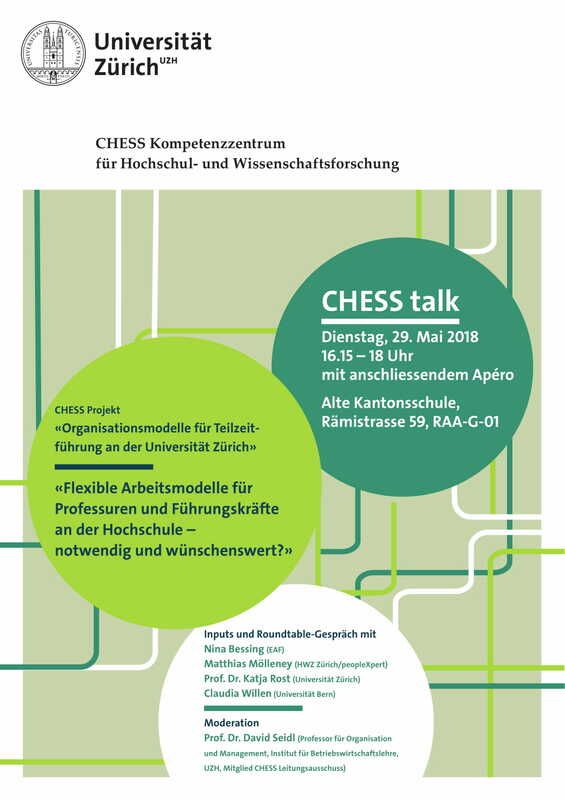 With this project CHESS follows one of its core objectives, to initiate interdisciplinary scientific debate on this relevant topic for higher education development throughout the university. Based on this, concrete formats will be developed and implemented at the UZH together with the stakeholders involved. The aim is to develop organisational models for part-time management based on their various scopes of action. The aim is to present a sustainable package of measures tailored to the different disciplinary cultures of the UZH with concrete organisational models for part-time management tasks. UZH benefits from the development of these innovative and flexible working models for managers by positioning itself as an internationally attractive employer in teaching, research and administration.